It’s the middle of the afternoon and Dauphine Bakery and Bistro (formerly the Queen of Tarts) is buzzing with activity. An eclectic crowd, sporting everything from high heels and fancy hats to flip-flops and T-shirts, fills the space. Pristine tables are dotted with silver teapots and china cups, but it’s the multi-tiered trays of dainty sandwiches and bite-sized treats that are getting all the attention. High tea is being served. Presiding over it all is owner Linda Kearney, who opened the shop in March and hosted the first tea party in time for the Royal Wedding. “People were calling to see if we were doing anything special for the Royal Wedding. I mean, I am the queen of tarts, and we’re known for our desserts,” she says. The response was so positive that Kearney is now hosting about one a month, usually with a seasonal occasion or holiday. Kearney is aware that, culturally, calling it “high tea” is a misnomer. Historically, the English ate two meals a day, breakfast and high tea, which was at the end of the day (it was eaten on high tables, thus the name). But it was a long time between meals, so it’s said that the ladies of high society started an afternoon tea, or low tea, with light snacks. It became a social event. So low tea is what we call high tea today. “We interpret it sort of like a light lunch. 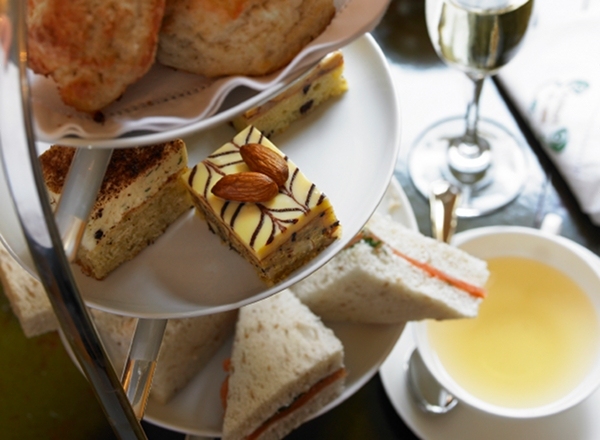 Sandwiches aren’t part of a traditional high tea, but people expect them. Our emphasis is on using local and seasonal ingredients. I don’t think that was traditionally the case,” Kearney jokes. At the Dauphine Bakery and Bistro, there’s an array of select loose-leaf teas, finger sandwiches and miniature desserts. The selection varies, but previous creations have included organic baker’s foie on brioche and wild shrimp on the house granary loaf. Signature desserts, including chocolate truffle brownies and Dauphine’s own lemon tarts, always make an appearance. The bistro hosts its next high tea on Sept. 23 for fall solstice. Reservations are required and it costs $25 per person. Kearney does private high tea by request, but a minimum of six people is required. Two other Edmonton institutions also host a high tea. The Arbour Restaurant and Tea Room* at Rutherford House offers a number of different afternoon teas with a traditional spread, including turkey pot pie. The Hotel Macdonald’s Harvest Room, although it’s currently closed for repairs, is closer to the Dauphine Bakery and Bistro, serving finger sandwiches, scones and desserts, but it also includes a hotel tour. *Editor’s note: The Arbour Room is now closed.